14-loop letterbraid (Ingrid Crickmore). Cotton embroidery floss and silk knitting yarn. Click twice on photo for more detail. Around the turn of the 21st Century, Noémi Speiser and Joy Boutrup somehow managed to resurrect the braiding methods for three 17th C. loop braided alphabet braids from total oblivion (two different 10-loop braids, and a 14-loop braid). The old manuscripts that described them must have been useful to the braiders who originally wrote them, but are completely unintelligible to a modern braider or weaver. The three braids are all 2-layer braids, made by two braiders working together, holding bicolor loops, and using the loop braiding equivalent of complementary pick-up patterning in weaving. Here, the ‘pickup’ is done by turning specified bicolor loops over on their fingers before doing the braiding moves. Turning a loop over drops the background color, and lifts up the contrast color that will form part of the letter-shape. The pick-up pattern areas are the only connection between the upper and lower layers of the braid. The 17th C. manuscripts on one of these braids – the 14-loop letterbraid – included pattern charts for each letter of the alphabet and for several other symbols. The charts apparently were meant to indicate which loops should be turned light or dark-side-up for each braiding cycle of unknown moves. Exactly which loops, however—and even how many total loops were in the braid—was unclear. Eventually, Speiser’s student and associate Joy Boutrup finally figured out all three letterbraid methods, including the “new” Nun’s Book letterbraid. Boutrup’s ground-breaking monograph on these three letter braids was published in 2009 as Part II of a four-part supplement to OEPBforLB, written in collaboration with Noémi Speiser: European Loop Braiding, Investigations and Results, 2009-2011. Part II is subtitled: Instructions for Letter Braids in 17th Century Manuscripts. After reading Noémi Speiser’s account of her struggles with the 17th C. letterbraid manuscripts in her loop braiding opus Old English Pattern Books for Loop Braiding, I was extremely excited to say the least when I found out that this huge mystery had been solved and that a whole publication was coming out on it! When I first dove in, I was initially a little discouraged, but luckily it turned out that it wasn’t necessary to understand all the technical details in order to get the gist of the way the charts worked, and how to incorporate them into the braiding instructions in the appendices. Joy Boutrup’s charts for the 14-loop letterbraid‘s letter-patterns are slightly revised versions of the originals, laid out in mirror-image symmetry that better reflects the left and right hands of the two braiders. They are not fundamentally different from the original pattern-charts, though. What is completely new is her understanding of which fingers the various columns in the charts correspond to, as well as her understanding of the braid’s structure and braiding method (which are independent of the patterning charts). She also figured out the braiding methods for both 10-loop letter braids, improved the pattern charts for the second one (the Nun’s Book letterbraid), and created 2 alternative sets of pattern charts for the first one – the so-called “Verbal Letterbraid.” The original pick-up instructions for its various letter-shapes had been in text only–incomprehensible jargon, for the most part—with no charts. The Verbal letterbraid was the first of the two 10-loop letterbraids that Joy Boutrup analyzed, and its original obscurely-worded instructions contained a truly mind-boggling red herring! The given lettershapes (as taught) can be produced only if a very odd “mistake move” (as I see it, anyway) is included with each row of braiding. This weird move was described – in a very hard-to-decipher way – in one of the manuscripts. Not only is it hard to decipher, but it’s so obviously ‘wrong’ that most braiders would never guess that’s what the writer really meant. But a few steps after making this “mistake” move, the mistake is then undone by a subsequent braiding move. In this case Boutrup had to deduce or infer the braiding method with no instructions to go by, solely by guessing which fingers the columns referred to, and then finding an order-of-operations for a 10-loop plain-weave braid that would result in comprehensible letter-shapes when following the given pick-up charts. She came up with two possible braiding methods for producing the letter-shapes! One is easier to learn, the other is faster to braid, so they are great options. But even though she had less information to start with, I would guess that the Nun’s Book letterbraid might have been less of a headache for her to figure out than the Verbal letterbraid, since at least its charts weren’t dependent on a mistake being incorporated into the braiding! Update: Gary Mitchell – with Joy Boutrup’s permission – has posted the pick-up charts for all the Nun’s Book letters of the alphabet on his FingerTips site! They are available here (link will open in separate tab). The print publication has more info, however, including an errata list. Update 2: For more about complementary pick-up patterning in loop braiding, see my in-progress series of posts and tutorials – go to my upper menu and click on the Pick-up tab. Caveat: Instructions for Letter Braids in 17th C. Manuscripts is not a set of instructions itself. It’s a scholarly monograph about three sets of instructions found in 17th C. manuscripts, and how Joy Boutrup deciphered them and reconstructed the braiding techniques. Joy Boutrup told me that she and Noémi Speiser expected the monograph to be more of interest to textile museums and historians, than to textile artists/ craftspeople. It’s a great resource on the heights that loop braiding had reached by the 17th C, and an amazing account of Joy Boutrup’s saga of deciphering and resurrecting these 17th C. techniques from the most minimal and confusing clues. Unlike OEPBforLB, this and the other three supplements in this series all have large color photographs of historical braid artifacts (and in this case, of Joy Boutrup’s reconstructions). It has succinct, text-only braiding instructions in appendices in the back, along with the patterning charts. The instructions briefly outline the braiding moves of one of the two braiders of a team. They don’t explain how to follow the pick-up pattern charts for the letters – that is covered in the main body of the publication. The instructions don’t explain how the two braiders combine their two halves into one braid – the “loop exchange move” that must be done in each row of braiding. That’s because team braiding techniques are covered in Noémi Speiser’s Old English Pattern Books for Loop Braiding. The letterbraid monograph was written as a supplement to Old English Pattern Books for Loop braiding, and doesn’t duplicate information from the earlier book. For those reasons, it wouldn’t be easy to learn how to make letterbraids from the ground up using this monograph alone. It would help if you already have experience in loop braiding as a team, as described in the old English loop braiding manuscripts. However, for the Nun’s Letterbraid, if you’ve learned my solo-braider method, you’ll be able to use that method, along with the Nun’s Book charts to make the rest of the letters. For the 14-loop letterbraid: if you and a braiding partner follow my 7-loop Spanish braid video-tutorial; and learn and practiced how to loop braid as part of a team of braiders, and have reviewed my video tutorial for following a letter chart in making the Nun’s Book letterbraid as a solo braider, Joy Boutrup’s instructions and charts should be much easier to follow. My video tutorial for the 7-loop Spanish braid teaches the braid that each of the 2 cooperating braiders would be braiding and combining together to make the 14-loop letterbraid. I made that tutorial so the 7-loop Spanish braid could be more widely known (it’s a great braid in itself, and not hard to learn if you already know how to braid a 7-loop square braid), as well as to help any braiders attempting to use Joy Boutrup’s monograph in braiding the full 14-loop letterbraid as a team. I myself still haven’t braided letterbraids as a team, only with my solo-braider workarounds, so details may need to be fine-tuned and worked out as you go. But my tutorial should have some useful tips. The way I braid the 14-loop letterbraid is spelled out (text-only) in an appendix to my 7-loop Spanish braid tutorial (click on “14-loop solo-braider method”). It requires holding three loops on each little finger, and one loop on each of the other digits, including thumbs. See also my “Too Many Loops” info page. Joy Boutrup makes these letterbraids both solo and as part of a team. Her own solo-braider method for multi-loop braids is hand-held loop braiding, using loops attached to kute (handles). She does not teach this in the monograph, however. In Braided Tunes, I show examples of an 18-loop letterbraid that I extrapolated from the 17th C. 14-loop letterbraid. *Re the Nun’s Book: Other than the Speiser/Boutrup publication I describe above, I only know of two other articles on the Nun’s Book: an in-depth article with color pictures by Noémi Speiser in Strands, issue 16, 2009. 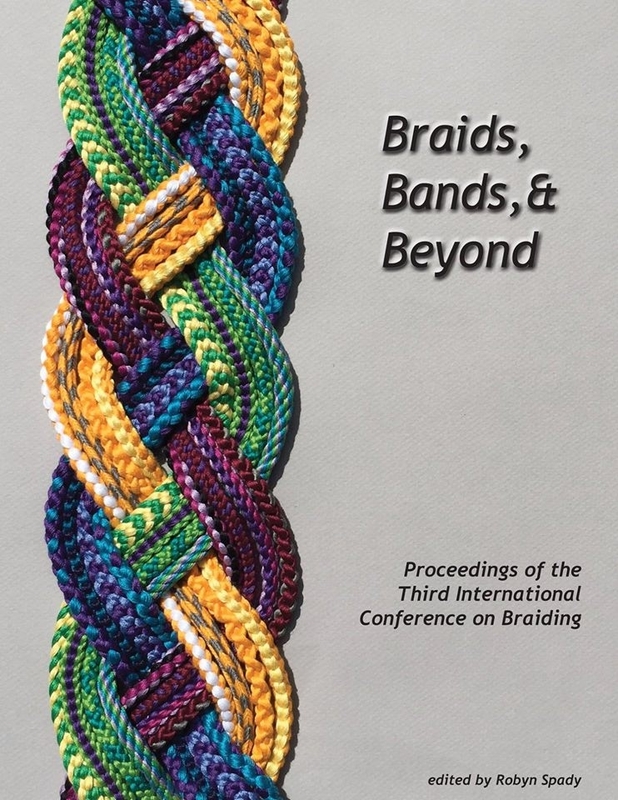 Strands is the yearly (print) journal of the Braid Society. The article is entitled: The Nun’s Book, 2008.67.1, Pitt Rivers Museum, University of Oxford, UK. The braiding instructions in the Nun’s book were labeled “Directions for Weaving Watch Strings” (!) They included instructions for over 40 braids, and over 30 swatches. Speiser’s article in Strands includes color photographs of some of the original manuscript pages, as well as descriptions and instructions for some of the braids. It doesn’t have any photos or info on the letterbraid, however – Speiser left that to be described by Joy Boutrup in Part II of their collaborative 4-part publication. There is also a short on-line mini-article (with no photos) about the Nun’s Book in issue 12 of L-MBRIC: Initial Observations on “The Nun’s Book” by Noémi Speiser. See full copyright restrictions and permissions at the bottom of the sidebar (if you are on a small screen, the ‘sidebar’ may appear somewhere other than at the side). Content of this website may not be posted or “reposted” online, sold, or used in fee-based workshops without my permission. It may be shared non-commercially off-line (for example with your friends, guild, or club if you are teaching for free) with certain restrictions – see full copyright info.